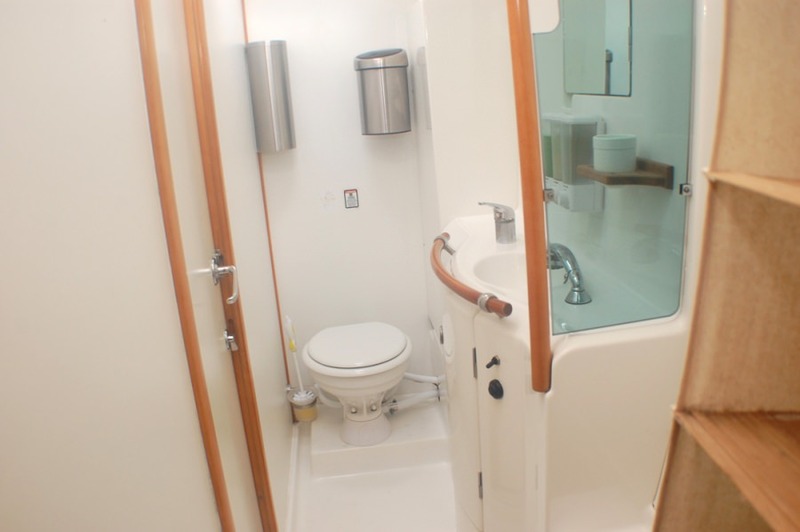 Mimbaw is a luxury Lagoon 410 dive catamaran with 3 cabins in queen size comfort for guests and 1 for the crew. Cruising the Caribbean in style Mimbaw is equipped with tanks and dive gear, including Nitrox, for up to 4 dives a day. In addition, the powerful dinghy allows guests to enjoy the thrill of wakeboarding, skiing and tubing. Perfect for thrill seekers, Mimbaw is a haven also for those wishing to relax on the large deck space in the sun while enjoying a cool cocktail. Or would that drink be preferred at the floating bar? 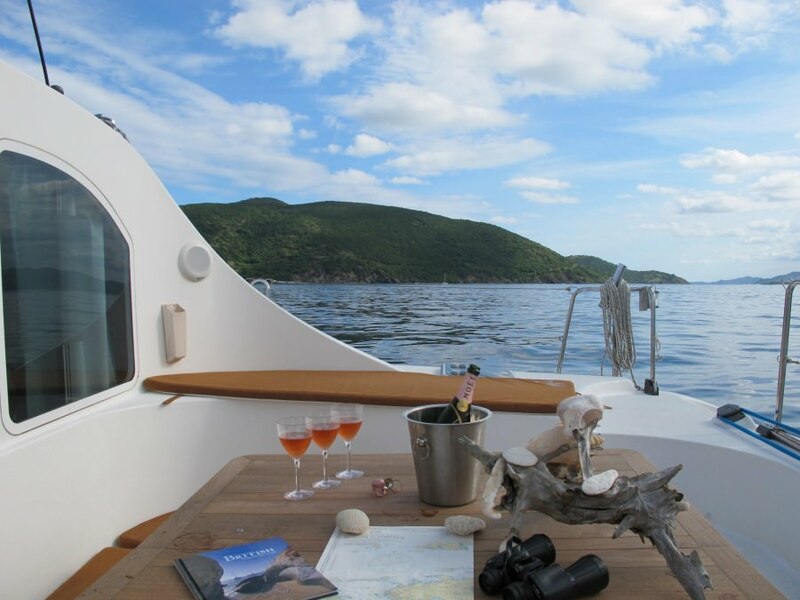 The experienced Captain/Chef crew ensure all the guests find what they are looking for on their special vacation. 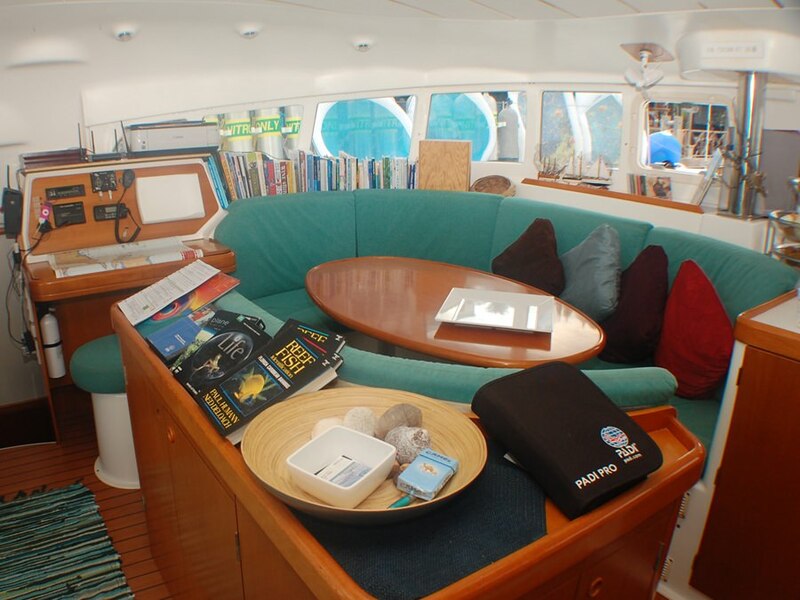 The Divemaster captain is very knowledgeable of the islands, their best dive spots and secluded anchorages. The Chef is the perfect hostess, creating a unique Mimbaw atmosphere for guests in which to savour fine food. 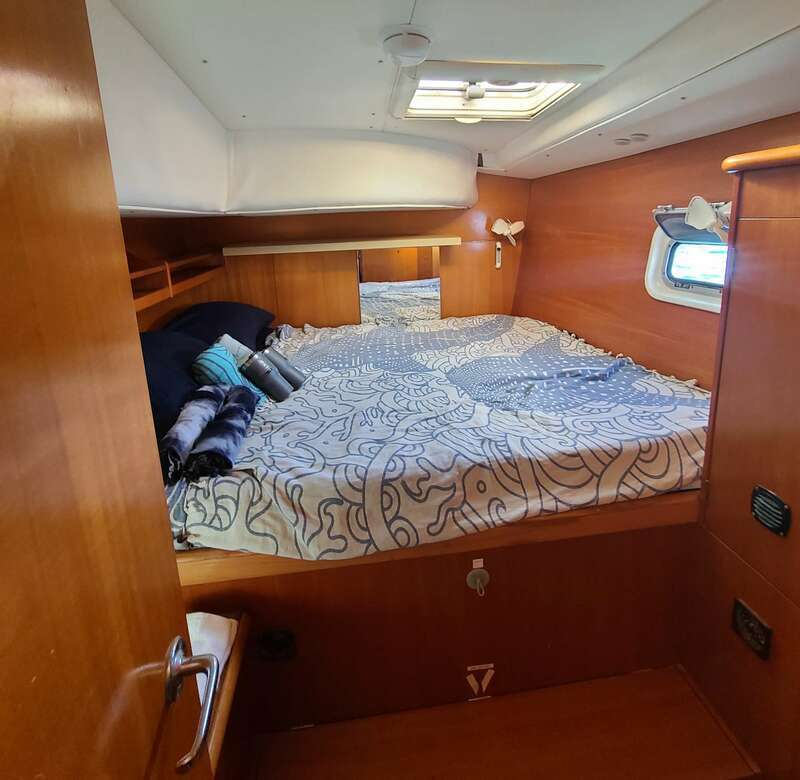 Leave behind the "hostel style" live-aboard dive vessels and enter into a luxury all-inclusive catamaran. Your private Chef/Hostess Kim will create culinary delights while you enjoy lounging on the trampoline, or on the jumbo beanbags between dives. We sail and dive the St. Maarten/St. Barth/Saba/Statia/Anguilla area and the British Virgin Islands. You decide where we sail! Mimbaw's experienced captain and dive instructor is eager to offer special consultations on the most pristine dive sites of the islands. Mimbaw is one of only a handful of dive yachts and the only one of its size- price range offering NITROX diving. Many toys including a fast dinghy for water sports like water-skiing, tubing, and wake boarding are available for your pleasure at no extra charge. A floating bar and beach lounge barbecue set will add to your unforgettable sailing and diving experience aboard Mimbaw. Mimbaw's great reviews have their clients saying it was the best vacation of their lives. Main Salon & Dining has 180 degrees of windows. Very airy and spacious. 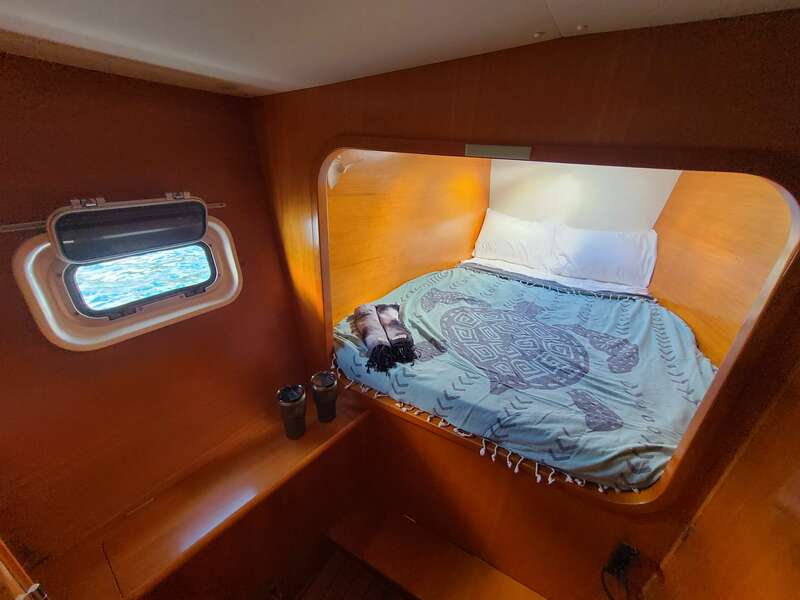 Lots of exterior space= the cockpit is a great place to lounge. 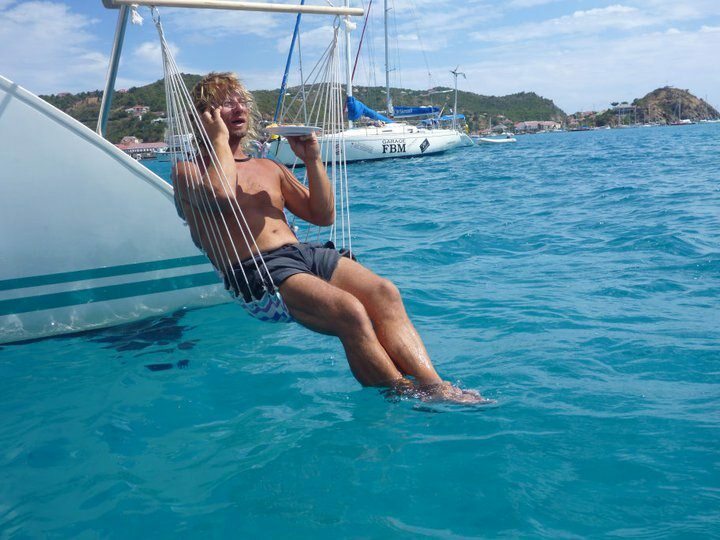 There is more outdoor space on a catamaran than a much larger monohull. 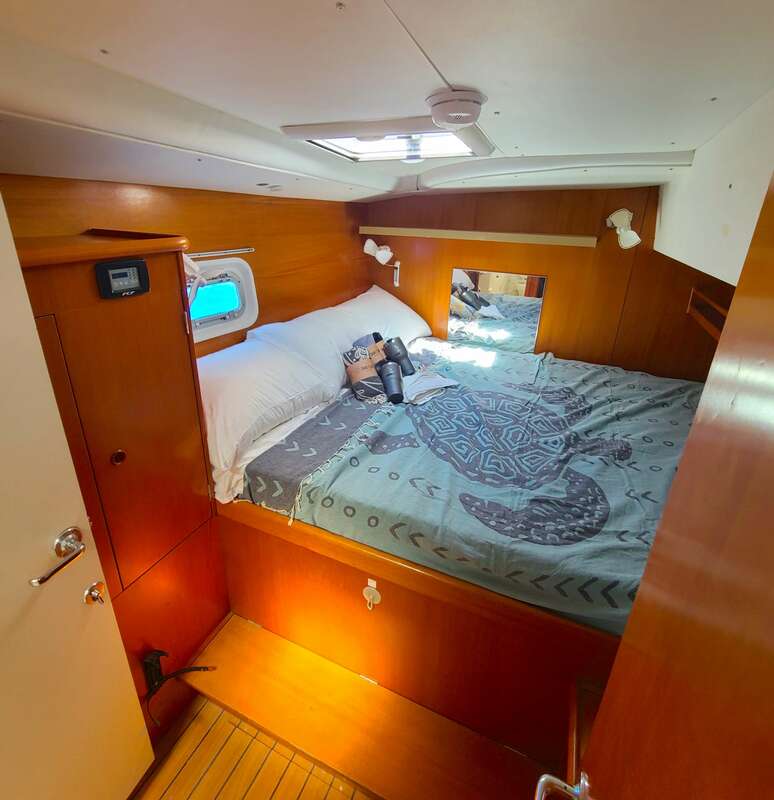 German TV filming "The Bachelor"
Port forward Stateroom Queen Bed. All rooms have 2 fans and a hatch to catch natural ocean breezes. Starboard Guest aft Stateroom Queen bed with ensuite head.